Mercedes Sprinter 4×4 Camper: Sportsmobile’s Next Big Thing is Here! Sportsmobile has been in the business of building great custom built campers from a ton of different base van platforms for over 50 years. After all this experience, it is no wonder that they never cease to amaze a consumer market always looking for new and innovative ways to go camping in style. At this year’s Overland Expo West, Sportsmobile showed off one of their newer projects — the transformation of a Ford E-Series Cutaway. But another vehicle that grabbed attention was the Mercedes-Benz Sprinter 4×4 camper. This recent addition to the US market now diversifies their product line with an efficient, all-terrain Sprinter diesel camper. Sportsmobile has been in the Sprinter market for some time now, building these campers since 2003. Unfortunately they were never able to put out a 4WD version until 2006. At this point Sprinter was sold by the Dodge brand in the US, but Sportsmobile created a converted camper with parts from Oberaigner, an Australian company that outfits Mercedes/Daimler Sprinters with hardware. Sportsmobile had plans to take this converted Sprinter to market in 2007 as the only US supplier of the Oberaigner based camper after showing it off at the 2006 LA Auto Show. For whatever reason, that didn’t happen. The details on why have never really been brought to light, but Sportsmobile says it was an internal decision due to the fact that Mercedes planned to bring the 4×4 to the US anyways. While others report that Mercedes halted the deal by not allowing Oberaigner to finish the deal. At the end of the day, there was no Sprinter 4×4 in the US. But things are changing. Mercedes has finally decided to bring the Sprinter 4×4 overseas for 2015. And for consumers in the market for a top of the line 4WD this is great news that is creating a lot of buzz. A huge draw-in for potential buyers, other than the recognition of the three-pointed star, is the unrivaled fuel economy for a four wheel drive Class B motorhome. The base model comes with a 3.0 Litre V6 turbo diesel engine with 188 horsepower and 20 mpg. And the word from Sportsmobile is that customers can anticipate 14-18 mpg on the converted camper. It is being dubbed the lightest 4×4 conversion with the best fuel economy ever. 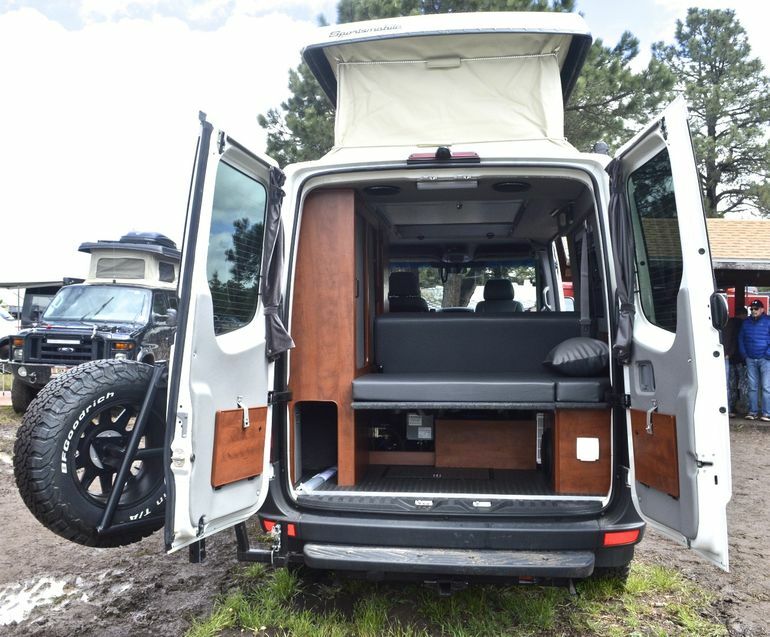 The van is also loaded with features, it can comfortably sleep 4 adults with an optional Penthouse top and folding in-cabin bed. Sportsmobile offers multiple floor plans and packages with a base price of $70,000 US. Additional options include equipment such as in-cabin heating and AC, as well as a propane stove, refrigerator, hot water heater and much more. Even solar panels and entertainment equipment are available. With the most sought after features installed, Sportsmobile estimates the Sprinter 4×4 camper will cost you about $90,000. 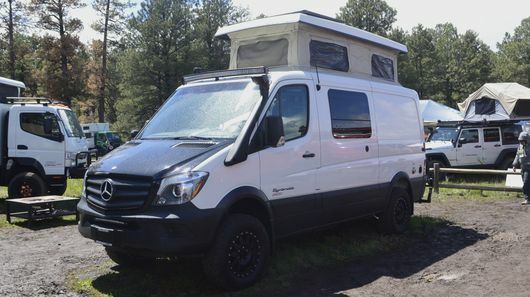 This camper has already made a big splash, with the company saying they are already sold out of 2015 Models and are now open for pre-orders for next year’s Sprinter4x4. Get them while they’re hot, because the next big thing is here.